This early morning image had all the earmarks of becoming a spectacular shot and although it turned out very nice,it could have been much better. the sky was just filled with clouds that would have lit up at sunrise but for some reason it kind of fizzled just when I was getting excited about the shot. I had to find the farmer in the barn as he was milking cows to ask if I could go on the land and he was more than happy to oblige. One funny thing that happened several times in the last week is me getting shocked as I climb over the electrified fences.Each time I gave them a cursory couple touches with the hand and each time nothing,until I start climbing or going under the fence and sure enough I get zapped. It kind of helps you get over the fence a little quicker. 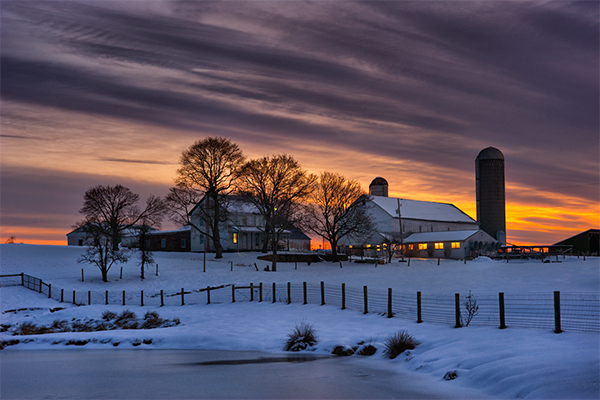 This entry was posted in Amish, Clouds, Landscape, Photography, Snow, sunrise and tagged Amish, Clouds, Farm, Glowing, lancaster county, Landscape, Photography, Snow, Winter. Bookmark the permalink. Thanks Victor. it had the makings of even better,but its quite acceptable.